It is only 38 degrees centigrade at the moment in this desert of stone and sand, situated three hours’ drive north-west of Cape Town (South Africa). 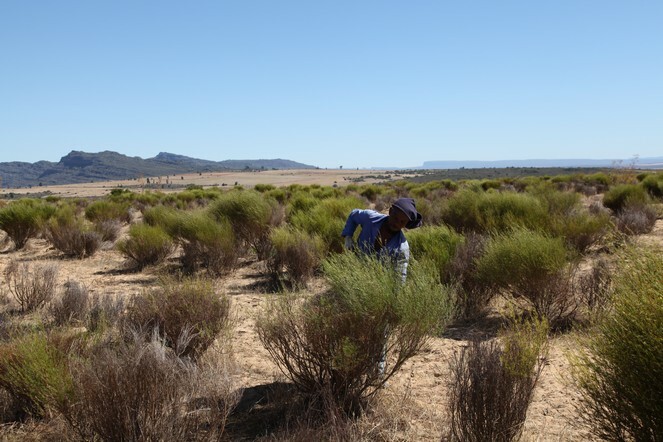 This temperature is relatively clement, as rooibos is often harvested at around 45 degrees. The heat does not bother Aspalathus lineari, also known as rooibos. With roots that bury themselves to depths of up to four metres, the bushes seek coolness deep in the ground. I wish I could do the same!